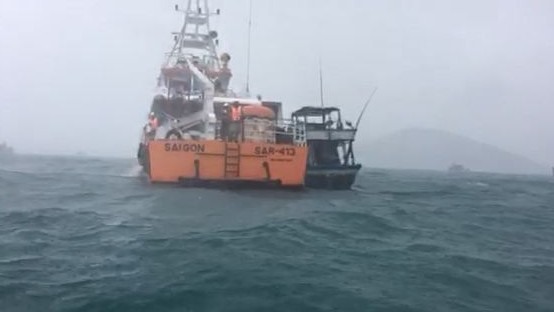 BẾN TRE — Four crew members of the fishing boat, BT 2102 TS, were rescued by the Việt Nam Maritime Search and Rescue Coordination Centre (VNMSRC) on Wednesday after three days at sea. On Sunday, while fishing in the offshore area, more than 60 nautical miles from eastern Sóc Trăng Province, the helm of the fishing boat owned by Bến Tre Province-based Đào Văn Vui suddenly broke. Besides Vui, there were three other crew members on board. After two days of floating on the sea, because of the tropical depression and food shortage, the crew members’ health began to fail. On Tuesday night, the captain sent an urgent rescue request to the VNMSRC. Receiving the SOS signal, they commanded the rescue vessel, SAR 413, to search and rescue the BT 2102 TS fishing boat.